The winner of the London Natural History Museum’s 2017 Wildlife Photographer of the Year People’s Choice award went to Ray Chin of Taiwan for his image of a humpback whale and her calf. 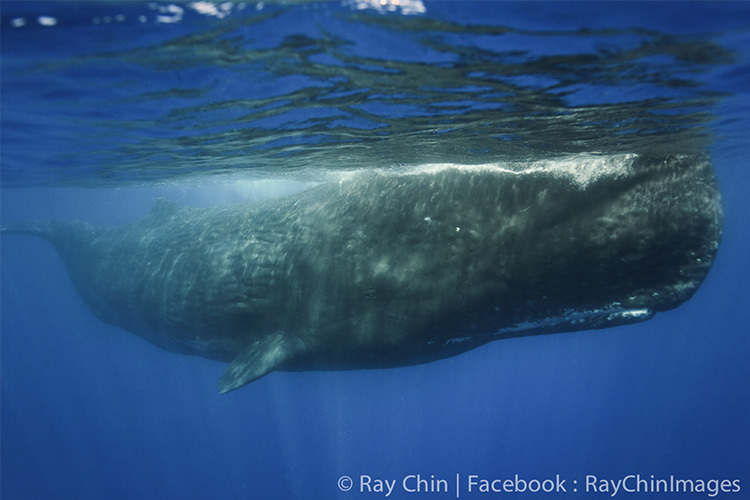 Chin is Taiwan’s first professional underwater photographer specializing in dolphins and whales. The award is the best validation of years of efforts chasing these creatures under the sea. Ray Chin, born in 1978, has the complexion of a man frequently exposed to the sun, a round face, squinting eyes, and most always a smile at the corner of his lips. While chatting with him, I cannot help but thinking that his smile reminds me of a dolphin’s. Chin spends seven months a year at sea chasing dolphins and whales. Some say that when you are fond of a certain animal, you take on some of their characteristics, and Chin’s appearance gives a hint of many years spent with various members of the Cetacea family. Chin majored in biology at university before pursuing a Master’s degree at National Taiwan University’s Institute of Life Sciences. An avid outdoorsman, he opted to research the pointed-scaled pit viper, a species of snake found only at high elevations. Later, while serving his military service in Hualien, he got to know the Kuroshio Ocean Education Foundation, through which his interest in chasing dolphins and whales was nurtured. He then spent all of 2001 at sea as a dolphin- and whale-watching interpreter. Studying in Taipei, with his family in Taoyuan, one day Chin was overcome with the impulse to view the sea, so he rushed to the northeast coast. However, its color just did not look like the sea to him compared the true blue ocean of Hualien. It was then that he realized he could never leave Hualien. 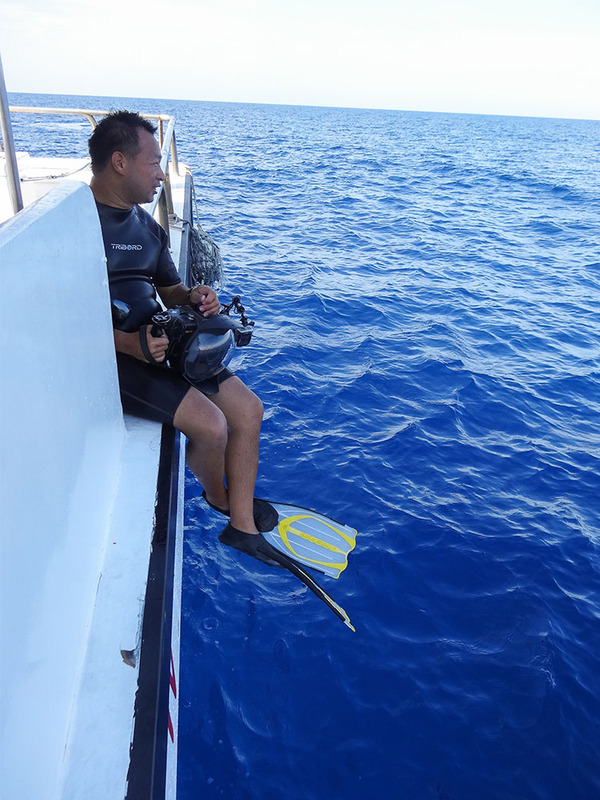 And after finishing his Master’s degree in 2007, he immediately entered a new chapter of his life, based in Hualien and chasing undersea mammals like whales and dolphins. 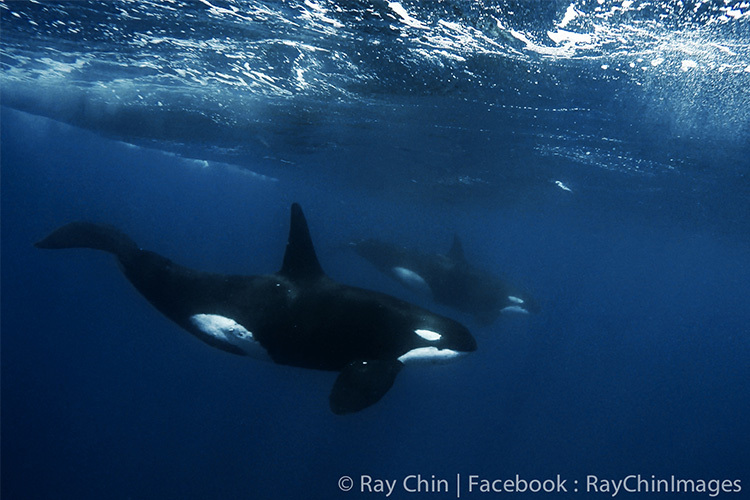 Chin’s child was born just around the time that he started pursuing Cetaceans in their undersea habitat. It is likely that the child will always remember, whenever word spread of dolphins or whales at sea, his dad grabbing his gear, arranging a boat, and rushing off to dive in and chase them. Just a little after his first birthday, the boy began accompanying his father at sea, where he often watched as he suited up, readied a camera, and jumped off the gunwale of the boat. Naturally, most of the time, Chin fails to get photographs or videos he is happy with. Upon being commissioned in 2007 to undertake filming of Dolphin Circles, a documentary project funded by the Kuroshio Ocean Education Foundation and the Council of Agriculture’s Forestry Bureau, Chin tried his hand at underwater shooting in addition to filming above the surface. However, his initial attempts at shooting off the coast of Hualien did not go too smoothly, and in fact included a three-year run of total failure. It seemed like every time he dove under, the dolphins just slipped away. This led to Chin’s decision in 2011 to go abroad to study underwater Cetacean photography. While overseas, he met many professional and semi-professional underwater photographers working for such outfits as the BBC and the National Geographic Channel. They helped broaden Chin’s vision, and he absorbed vast knowledge and technical tips like a sponge. 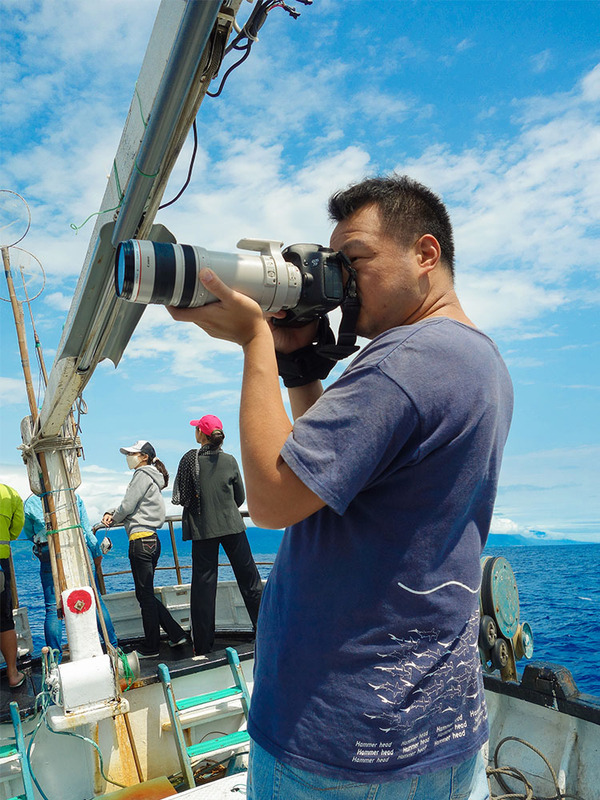 As a Cetacean photographer, although one can photograph numerous species like humpback whales, blue whales, and bottlenose dolphins abroad, Chin’s greatest aspiration is to be able to shoot these creatures each year in the undersea environment of Taiwan’s surrounding waters. The best conditions for this occur between June and August, during which time Ray tries his best to stay in Taiwan to chronicle Cetaceans at sea. The rest of the year is spent following the migratory creatures. In 2012, Chin was finally able to make the first visual chronicle of sperm whales in Taiwanese waters, causing tremendous excitement. In 2014, Chin even encountered sperm whales that would voluntarily seek him out and approach him, earning him the nickname “Sperm Whale Whisperer” among his partners at the Kuroshio Ocean Education Foundation. Over time, he was able to compile a register of whales he got to know as he photographed sperm whales, false killer whales, patterned dolphins, spinner dolphins, and bottlenose dolphins. And he has even caught a rare glimpse of a killer whale around the waters of Taiwan. “There is a high degree of diversity among Cetacea in Taiwan’s waters,” Chin cheerfully states. The whale watching boats operating in Tonga are owned by foreign nationals, mostly hailing from Australia and New Zealand. Fortunately, they tend to practice good environmental consciousness. For example, when they spot whales or dolphins, rather than just going right in to get close, they get in touch over the radio arrange to take turns in an orderly fashion. “These are all licensed, disciplined operators who follow the rules of whale watching, which are all crucial to safeguarding whalewatching quality,” Chin relates emphatically. As humpback whale tours in Tonga have grown in popularity in recent years, rather than increase the volume of tourists, operators have opted to raise tour prices to put a cap on visitor volume and avoid further burdening the undersea creatures and the environment. In contrast, impotent whale watching regulations and the low caliber of boat operators in Taiwan leave considerable room for improvement. As an underwater Cetacean photographer, Chin keeps frequent track of sightings, recording around a dozen humpback whale appearances in 2017 and 2018 alone. On one such occasion, the data shows that the humpback whale lingered in the same position for around 10 days. After years of photographing humpback whales in Tonga, this news made Chin especially happy. And sightings have not been limited to Taiwan’s eastern seaboard. In fact, a fisherman photographed a humpback whale off Ta’an near Taichung on Taiwan’s western flank in January of 2018. Chin always has his 23-kilogram photography kit at the ready, prepared to jump out the door and into the water at a moment’s notice whenever there is a Cetacean sighting. Due to the unpredictability of conditions at sea, such as visibility and animal behavior, Ray’s gear stays in his bag most of the time. Chin’s spinner dolphin photos from 2015 amply illustrate the rarity of good conditions coming together, as only that very two and a half seconds of footage was successful out of 15 dives all summer. Yet Chin remains undaunted and undeterred, trusting that this all comes with the job. “Capturing more complete underwater Cetacean footage helps to accurately identify individual dolphins and whales, creating scientific value.” So even if he only ends up with 2.5 seconds of footage, and only one species of underwater mammal, Chin is determined to keep going. Chin chuckles and says he is not cut out for a stable life, and has trouble accepting a static environment. This makes winter, when diving is out of the question, a difficult time for Chin, who finds himself forced to stay at home and write. Still, the time off allows him to reflect on a life running after whales, gather his thoughts, and put them down on paper.